If, as the back of The Wicker Tree DVD box claims, The Wicker Man is the Citizen Kane of horror films, then The Wicker Tree is the Lost Boys 2 of sequels. Sure, many of the ingredients of the two films are the same: from the charming, canny use of music, the beautiful locations and, er, the plot to the dodgy accents, stilted dialogue and really quite bad acting. Yet what came brilliantly – almost accidentally – together to create a wonderfully dark, unsettling and original horror film back in 1973, almost forty years later it all falls woefully apart. This time round our willing Christian virgin fools hail from the good ol' US of A. Pert, blonde, snub-nosed country and western singer Beth Boothby (Brittania Nicol) and her down home partner Steve (Henry Garrett, plus inseparable, battered cowboy hat) are silver ring Born Again Christians on a mission to Scotland to convert the heathen. As doors slam in their faces in the big city (despite the fact that Beth is a singing celebrity, one minute hounded by the press at a concert, the next traispsing round Pilton in a raincoat) they accept an invitation from laird/nuclear power station owner (and self-styled Mr Burns) Sir Lachlan Morrison (Graham McTavish) and his wife Lady Delia (River City's Jacqueline Leonard) to stay in the idyllic village Borders village of Tressock and have a crack at the locals there. At least they're polite, apparently. And, you know, goddess-worshipping pagans who must make an annual May Day sacrifice to return fertility to the village. But while there is a terrible, inexorable logic to the original film, here nothing really makes sense. Like The Wicker Man's Lord Summerisle, who we glimpse briefly as poor Christopher Lee is dragged in to inject the proceedings with some gravitas, our laird has a pragmatic, even cynical approach to religion as a means of pacifying restless natives. But although Summerisle can at least hope that the islanders' rituals will bear fruit, Sir Lachlan knows Tressock's cannot: the village is infertile because its waters have been poisoned by his nuclear power plant. In effect, besides being a terrible, ruthless business man, he's sanctioning an annual double murder, and appears to have been getting away with it for years. Where are the police in all this? Oh, being shagged into intensive care by local strumpet Lolly (Honeysuckle Weeks from Foyle's War, trying valiantly to be good in a truly awful role). And if you think I put that crudely, its nothing to the cringeworthyly crass one-liners that litter the turgid script. In place of The Wicker Man's eerily off-kilter Western islanders, who appear to have stepped from a documentary rather than a feature film, we have a comic collection of Scottish stereotypes which make the characters of Monarch of the Glen seem hard-hitting and gritty. Knocking back whisky like water, they bungle even the simplest of tasks, finally emerging to dance round the eponymous Wicker Tree (which seems to have been shoehorned in simply because it's in the title) like a bunch of body-painted crusties on Calton Hill. And instead of noble, upright, tormented, stubborn, decent, determined Sergeant Howie, whose commitment to his stern Presbyterian creed is never in doubt, we have two silly young people who seem utterly confused every time anyone asks them a question about the Bible and who cave in to temptation at the drop of a (cowboy) hat; Christians who seem fair game to be thrown to the lions. Sorry, quite a few spoilers there. 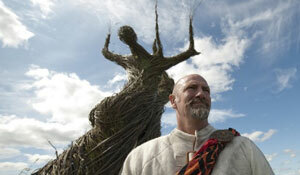 But if you've seen The Wicker Man (and if you hadn't, why on earth would you bother with The Wicker Tree?) you'll know our hapless couple are doomed to die – the only suspense lies in fearing this daft plastic pair might actually escape.